Happy Birthday Pop Up Card! For the card front, I have used a pattern paper from Watercolor Wash Brights paper pad. 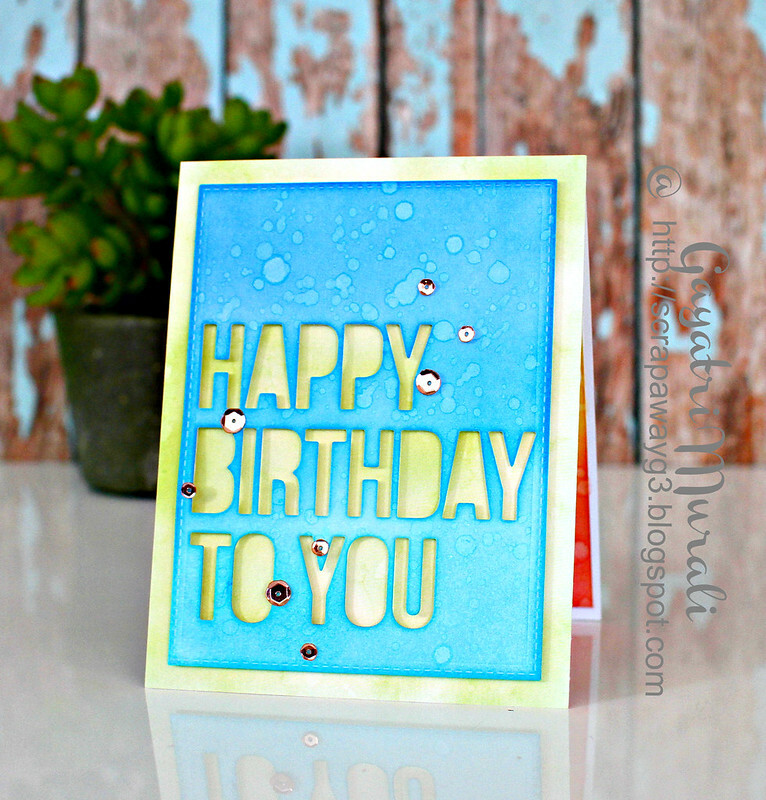 The panel is die cut using the stitched rectangle die from Blueprint Sketch 29, sponged with Mermaid Lagoon, Salty Ocean and Peacock Feathers distress ink and die cut using die namics Happy Birthday to You. This panel is adhered using foam adhesives and embellished with Rose Gold sequins. On the inside, I trimmed a card stock about half an inch smaller than the card front and scored in the middle. I sponged Abandoned Coral, Spiced Marmalade, Squeezed Lemonade, Salty Ocean and Peacock Feathers distress inks. Spattered with clean water and dabbed them to get some texture. Then I used the die namics Pop Up Elements Narrow to die cut three pop up elements. 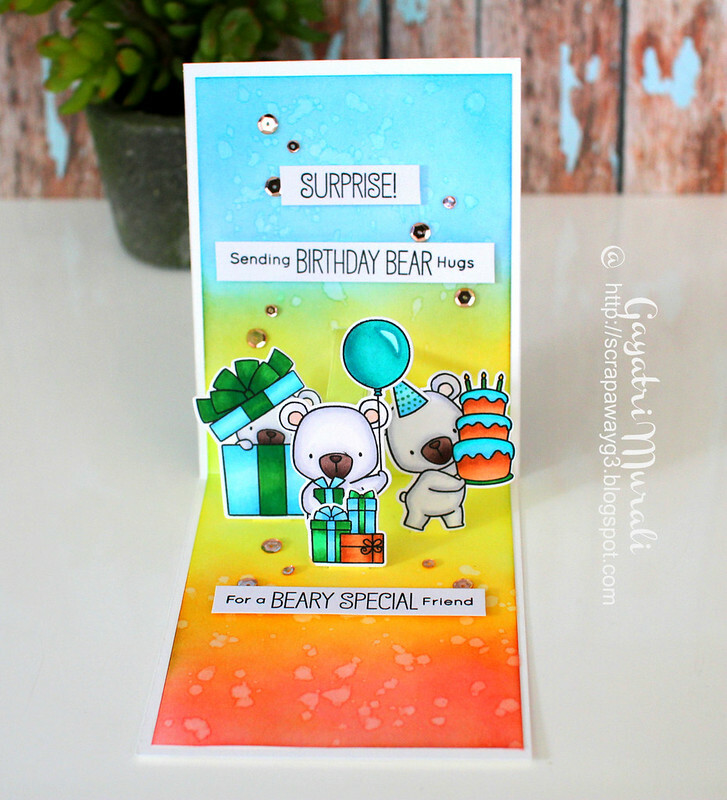 The images on the pop up elements are from Beary Special Birthday stamp set. I have coloured them with copic markers and die cut using the coordinating die namics. The sentiments are also from the same stamp set which I have stamped on white card strip and adhered using foam adhesives. Finally embellished with Rose Gold Sequins. I am loving the interactive die namics from MFT. So much easier and fun to make interactive cards. 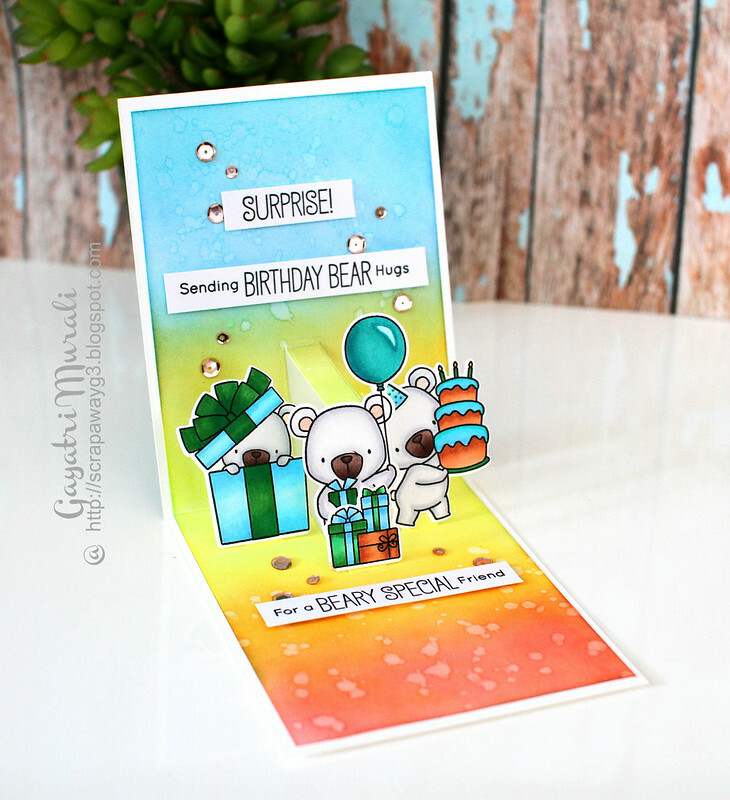 All the products I have used on my cards are available at both MFT store as well as Simon Says Stamp Store. Love the colouring on both your cards. Amazing!